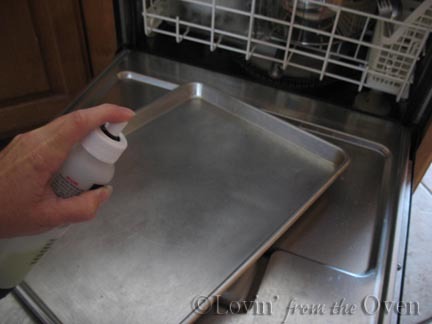 The next time you spray a baking sheet, do it over your dishwasher....much better and easier to clean than spraying over your sink! P.S. I love my Mister Mister ~ I fill it with canola oil and use it regularly! Some pans loose the warranty if you use sprays on them and that is pretty discouraging when you buy some of the expensive ones. Everyone should read the fine lines when it comes to those kinds of purchases! I usually spry over my sink. What a great idea!